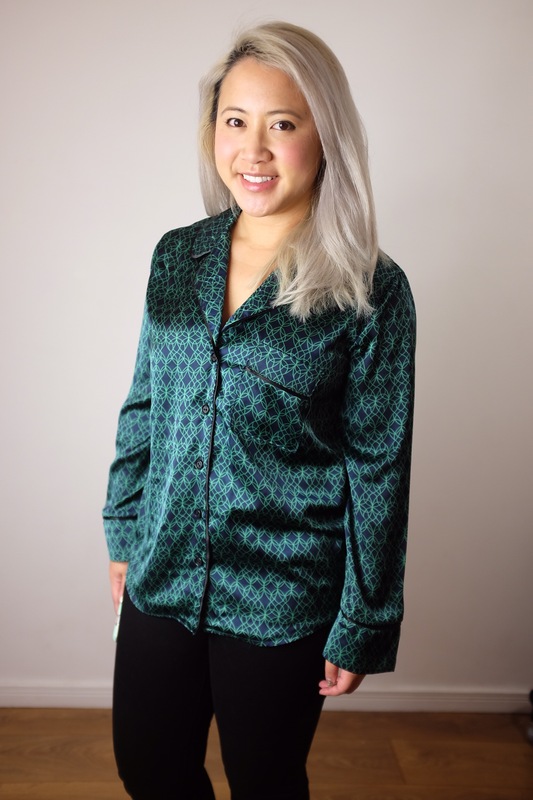 I know most of us sewists don’t necessarily get into sewing to keep up with fashion trends. 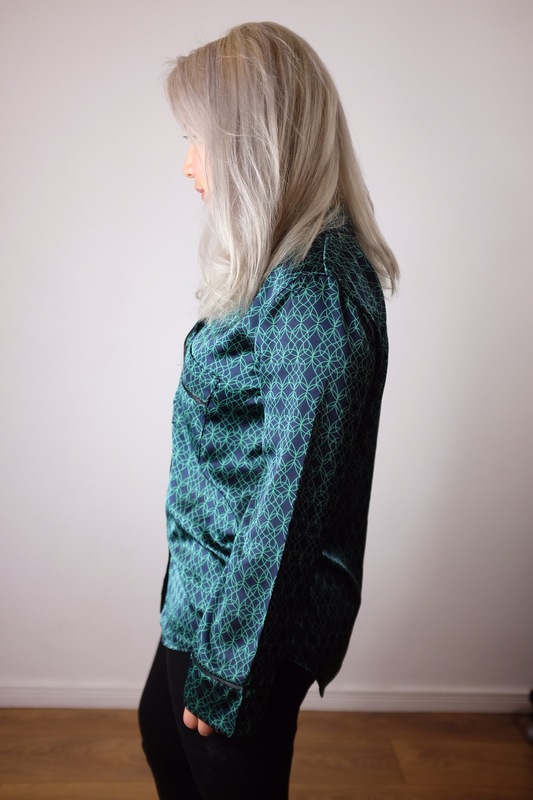 It tend to be more of a “I want regular clothes that suit my tastes and fit really well” rather than trying to be at the cutting edge of fashion and trends. For me it’s a little bit of both. I love being able to make beautiful basic clothes that I’ll wear everyday but I also want to be fashion forward and make stuff that is whimsical and fleeting that I know I’d rather spend a bit of time making than shell out and but RTW! 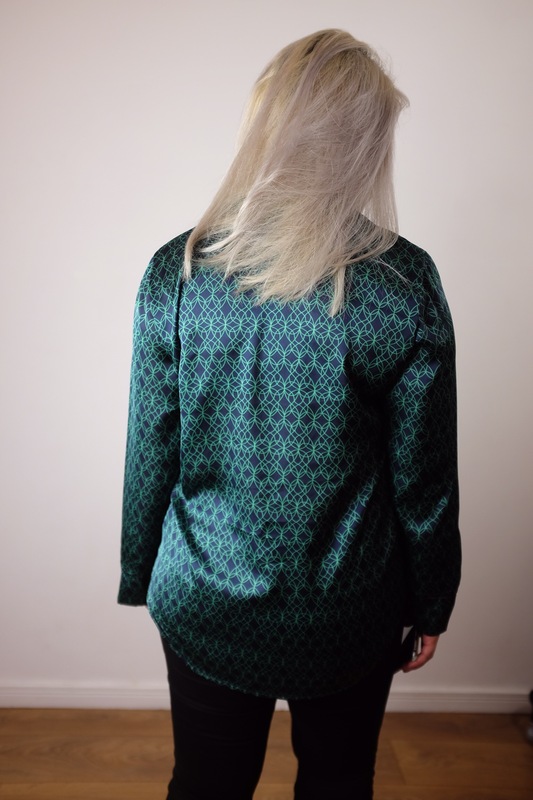 Which brings me to my latest project – a pyjama blouse! I loved the idea of wearing nightwear as daywear. 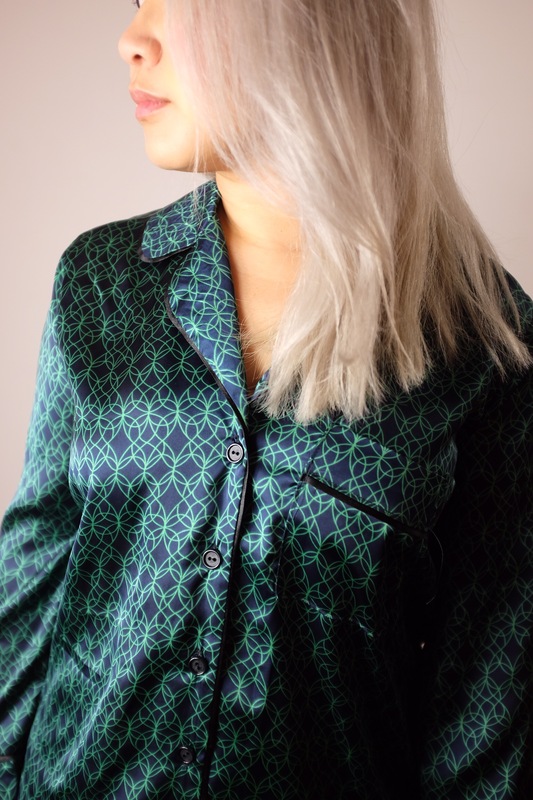 Let’s face it, who doesn’t want to just lounge about in their pyjamas all day on occasion? It’s not exactly a new trend , I’d definitely seen these about for a year or longer, but I’ve only now gotten round to making one after purchasing the Carolyn pattern from Closet Case towards the end of last year! I destashed this lovely navy blue and green printed satin poly for this project. (I say destashed but I’ve still got like 2 metres left of it so it’s technically still in my fabric stash…). I made a bit of an error when handling it to be honest. I had forgotten how difficult it was to use this kind of fabric – it’s not one I would regularly work with – and I just cut the pieces straight from it with no further prep work. Inevitably all my pieces were kind of wonky and asymmetric… At that point I remembered what I wanted to do when working with a slippery fabric next! Use starch to stiffen it! I think someone recommended it a while back when I made my Lena dress and I thought that that was a really worthwhile tip to try out in future. I didn’t want to waste what I’d already cut so I thought I’d try to starch those pieces then trim them to make them useable. Well, attempt to anyway! Obviously I didn’t actually have any starch spray at the time so I looked to the internet for alternatives! There were lots of recipes for a natural starch spray using cornstarch (cornflour in the UK) but of course I didn’t have any cornflour either. I managed to find one recipe using plain flour though and that I did have! So I spent one evening making a flour based starch spray (I put it in an old spray bottle), I laid out my pieces as straight and flat on the wooden floor and spray them all down the starch and left it overnight. I peeled each piece off the floor (and yes they were kinda stuck) and they were like paper! Definitely much easier to use than in its previous state. From here I trimmed each piece to be symmetrical and in line as much as possible with the original pattern pieces. Of course some things were just way off so I just aimed to get them matching with each other as much as possible to enable to sew it together (i.e. the facings matched the front edge and the under collar and collar would match up etc). At that point making it up was relatively easy. Except for the piping. That was it’s own battle. I made my own bias binding out of some black satin. Not my wisest choice as that stuff moved even more than my main fabric! (I just kept picking winners here). I opted to use the binding flat which I thought would be easier but actually I think that made my life harder… To cut a long story short it moved all over the place and has meant my piping details varies in width throughout the garment if you look closely (please don’t!). Um, I’m really rethinking about whether I would wear this out… How do people style to make it look so cool? It really just looks like pyjamas on me. Nice pyjamas but pyjamas nonetheless. I may just have to make the matching bottoms and leave it as nightwear only! Maybe belt the waist and pair with a pencil skirt? For my money I’d probably just make the pants with 2m left! I think that’s what I’m going to have to do! You can’t tell you struggled to manage the fabric, it looks really well finished but not sure how you can style it to not look like a pj top!! I’m not the best person to advise on fashion as have no clue, just sew what I like!! Lol. I’m definitely going to have to rethink how I handle fabrics like this in future so I don’t have the same issues! I think these will end up being actual PJs to be honest! I’ve never tried piping…I guess a satin one would be even harder than I could imagine! Nice job! It looks so luxurious and silky. I’d wear it all day. I’d def recommend using regular piping before trying satin – this wasn’t much fun to do! I’m thinking I’ll just make the brooms. It’s nice to look good whilst mooching about at home!